SEOUL, KOREA - Pinoy Artists in Korea is set to organize its debut event in October 20, 2018 in ASEAN Hall (near Seoul City Hall) to pursue its vision to uplift the Filipino culture and arts in the land of the morning calm. 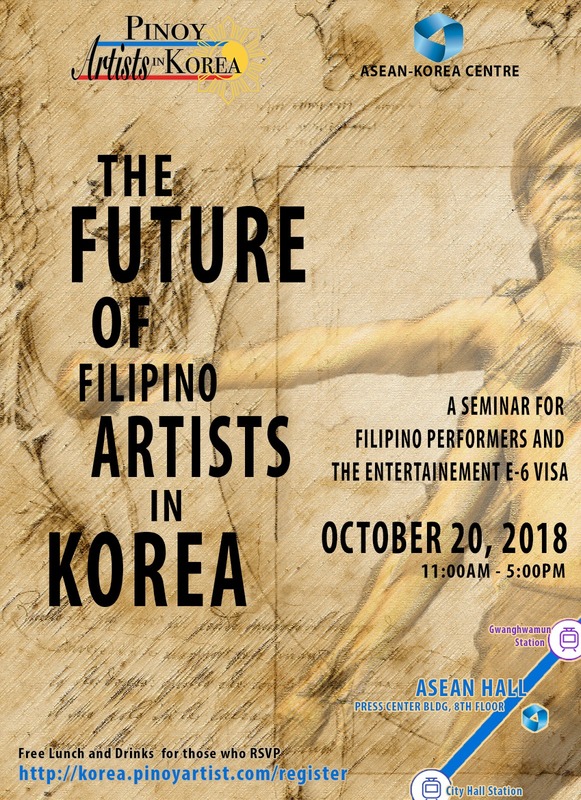 Dubbed as “The Future of Filipino Artists in Korea”, the seminar aims to bring awareness of the issues of the professional entertainers and provide educational insights with regards to the E6 visa. It also aims to supply new creative ways in performing and collaborating with other fellow artists. The event is in partnership with the Philippine Embassy of Korea and ASEAN-Korea Center. Pinoy Artists in Korea (필리핀한국예술협회) is a Filipino organization formed after Philippine President Rodrigo Roa Duterte visited Seoul last June 2018. For media partnership and partnership proposals, feel free to email nash@pinoyartist.com. For sponsorship inquiries, contact karen@pinoyartist.com or (+82) 010-407-24940.